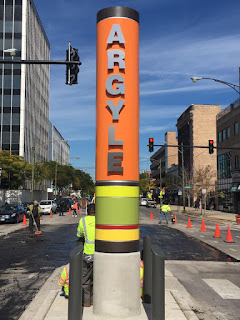 "Tomorrow, the celebrations will continue as Mayor Rahm Emanuel and I host a ribbon cutting and dedication ceremony of the Argyle Streetscape. Please join us at noon at the intersection of Argyle and Broadway as we celebrate the completion of this transformative project. Argyle is the first "Shared Street" in the city of Chicago - this innovative street design gives pedestrians right of way and slows car traffic in order to foster more vibrancy in the Argyle business district. Thank you to our neighbors and businesses who have been incredibly patient during the construction process." As a resident of the neighborhood for over a decade, I'm not sure the investment is worth the outcome. The new brick and green spaces are nice, but the traffic, parking and signage are a complete mess. Also, until Argyle is cleaned up, the project will have been in vain. Some of the newly installed poles, etc. are already broken or ruined and the new brick is filthy and covering in gum. It's unfortunate.